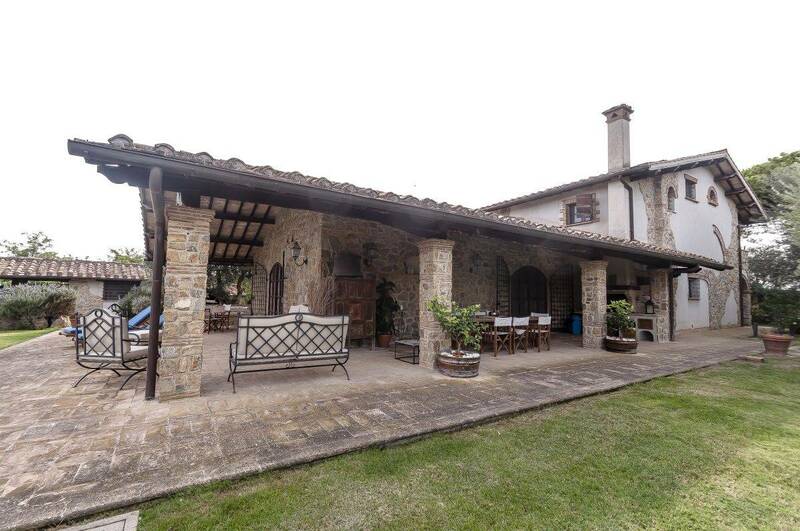 “Casale degli Ulivi” is well located inside the typical environment of the Tuscan countryside that surrounds it; the Villa is built with fine quality materials such as local stones, wood and wrought iron, being used both for the insides and the outdoor garden, such as the large iron entrance gate, the stones paving the car park and various stone walls embellishing the garden. 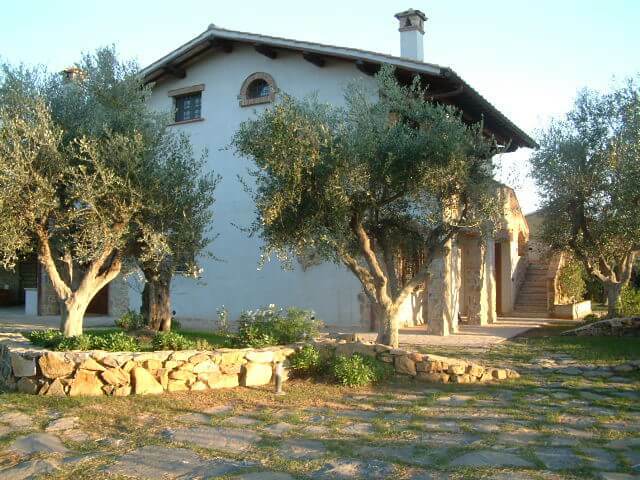 The Villa is located on three levels and surrounded by large and ancient olive trees together with typical Mediterranean plants. 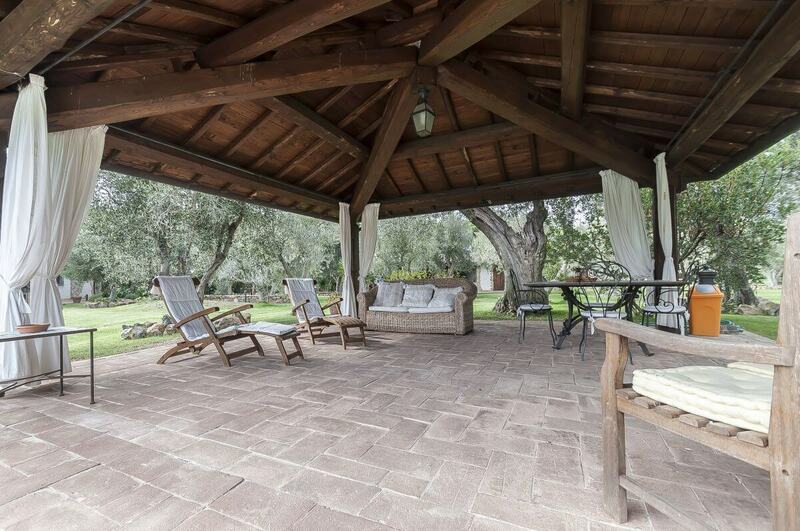 The outside porch, being furnished with an elegant wooden table and chairs, is built with stone columns surrounds almost the entire Villa, which has two entrances: the main one on the ground floor and the other one that allows direct access to the first-floor Suite. 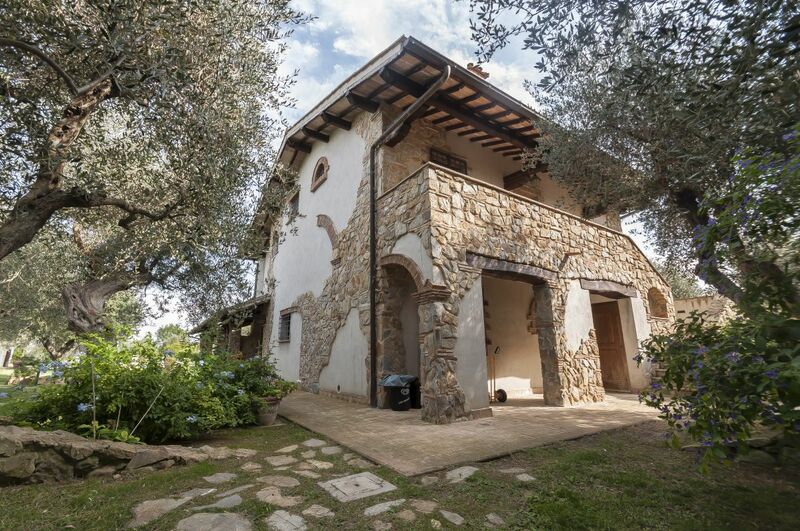 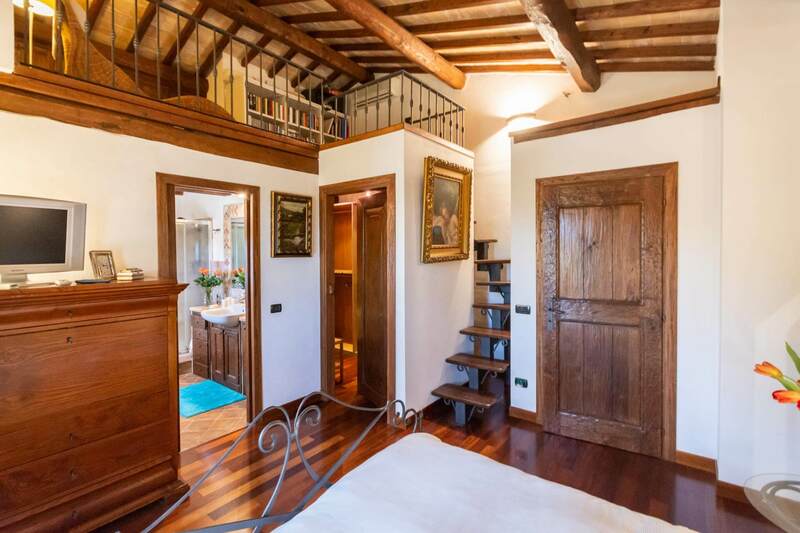 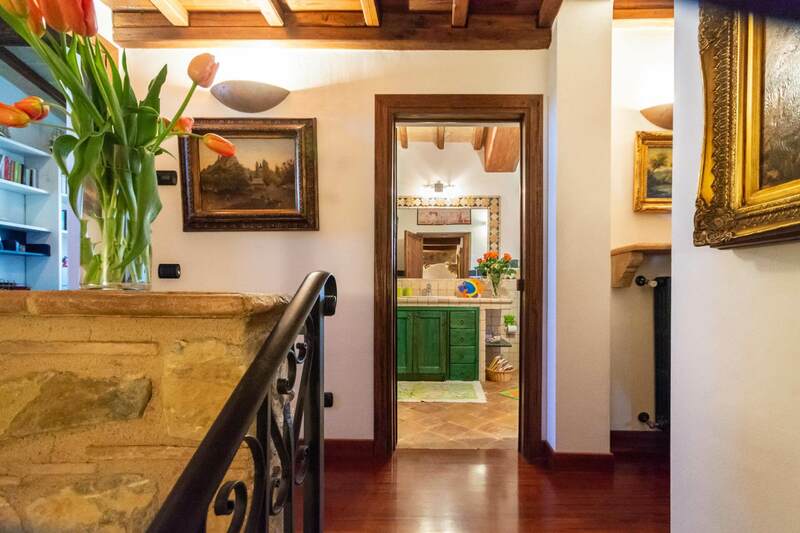 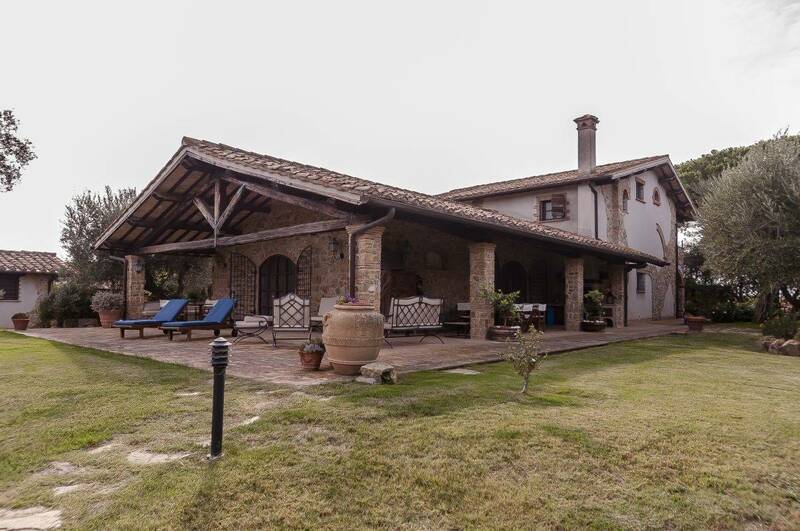 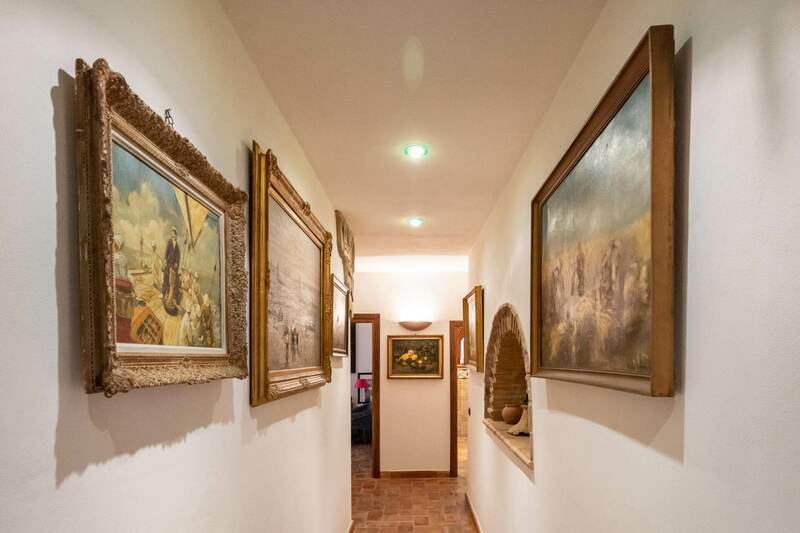 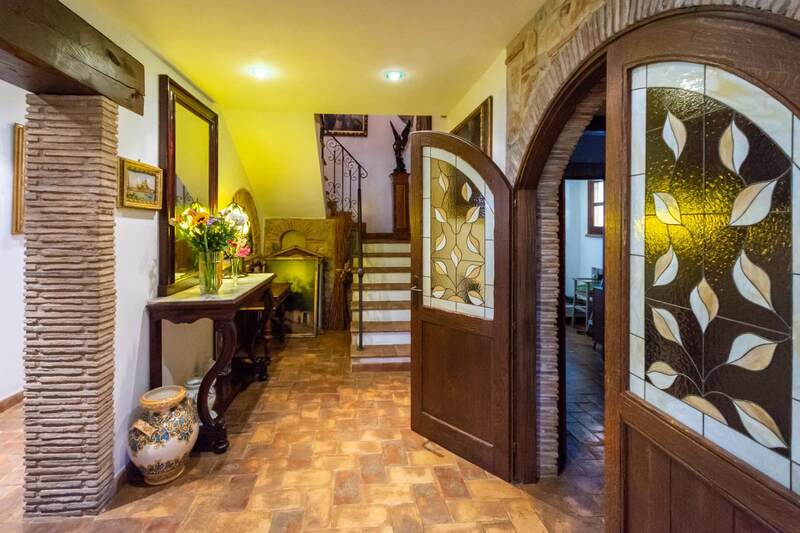 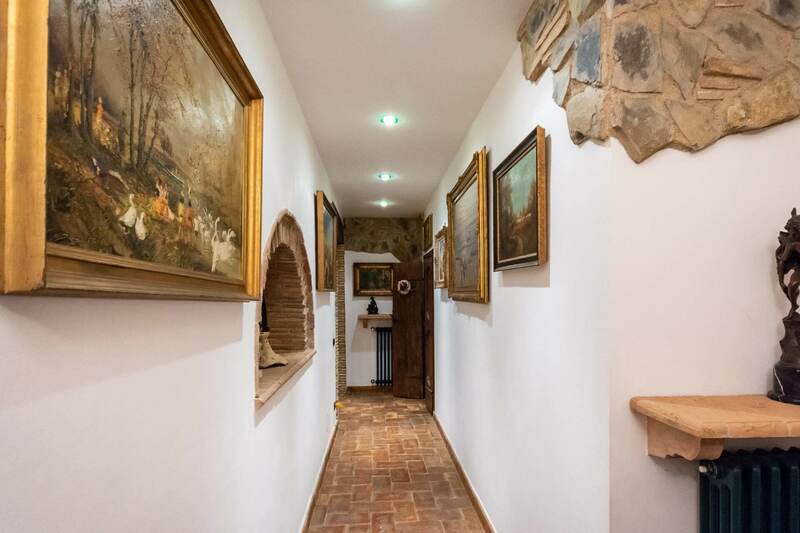 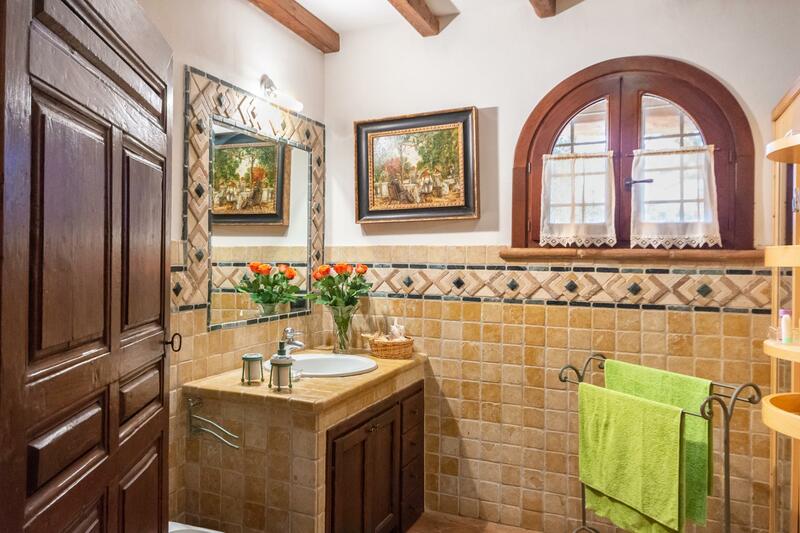 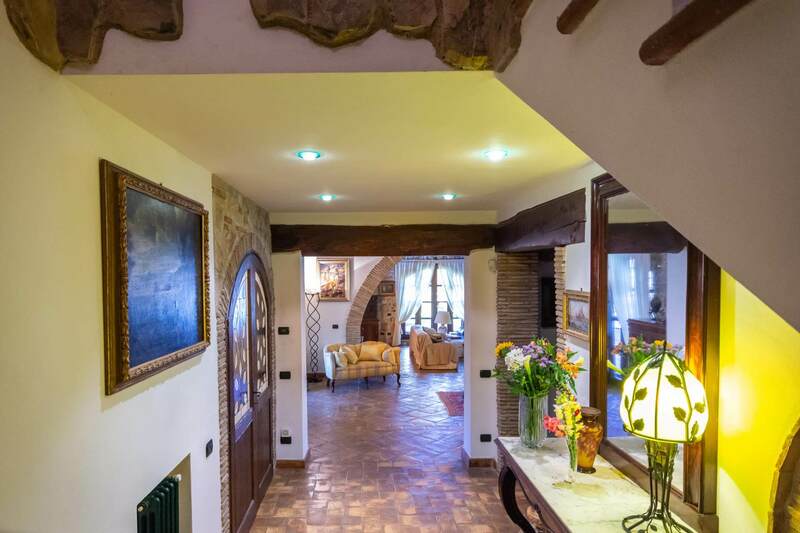 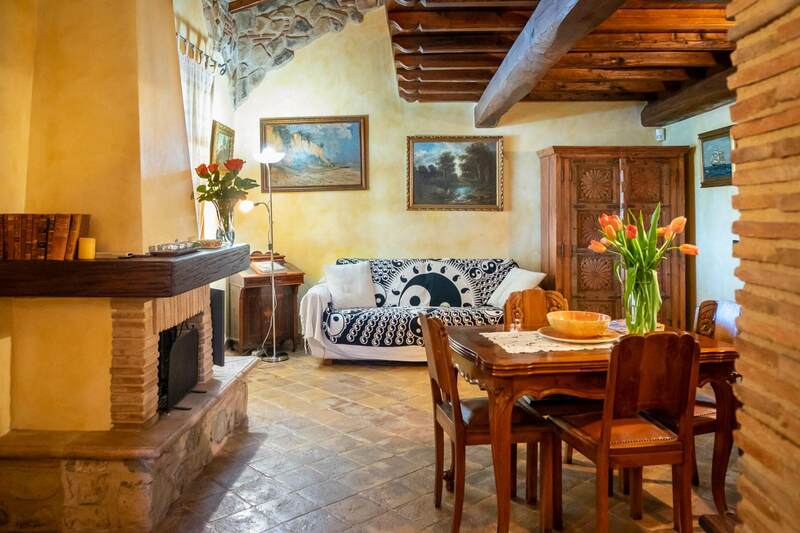 A large and ancient Tuscan wooden door will welcome you to the entrance, characterized by a dressing room and small closet, and leading you to a spacious area with a double living room. 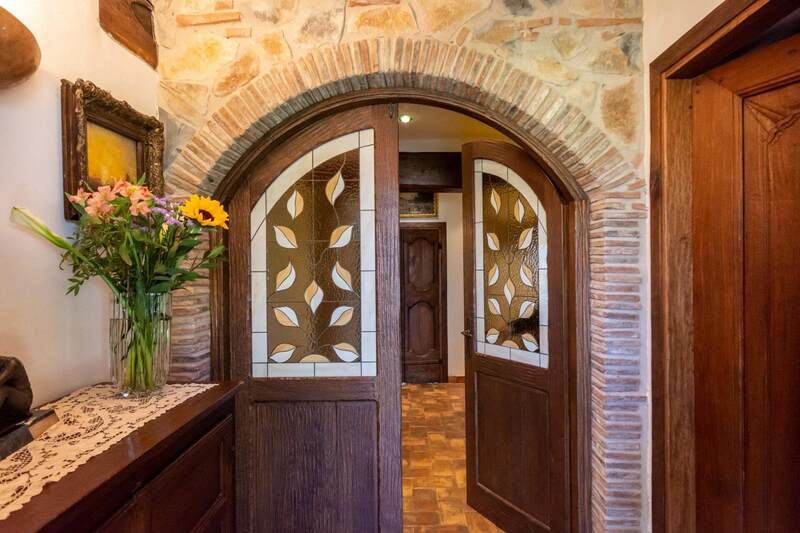 A great brick arch separates the living area from the dining room. 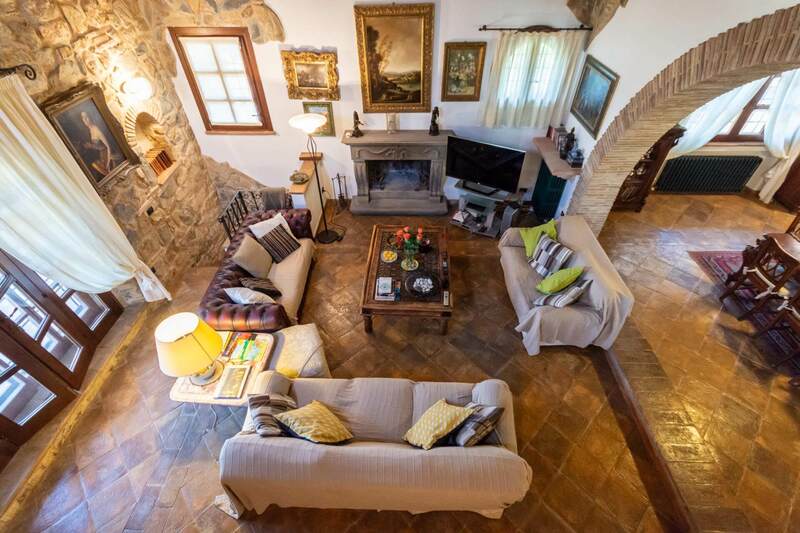 The living room has 3 comfortable sofas and an armchair, being positioned in front of the stone fireplace to enjoy a unique atmosphere with elegant and stylish furniture, fine paintings and a flat-screen TV. 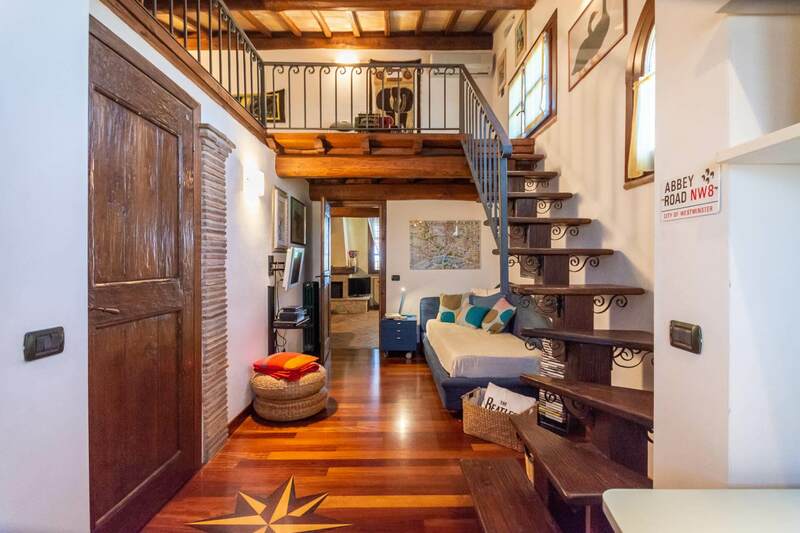 On one side of the living room there is a stone staircase leading to a mezzanine with an armchair, the ideal place to intimately relax while listening to music or reading a book. 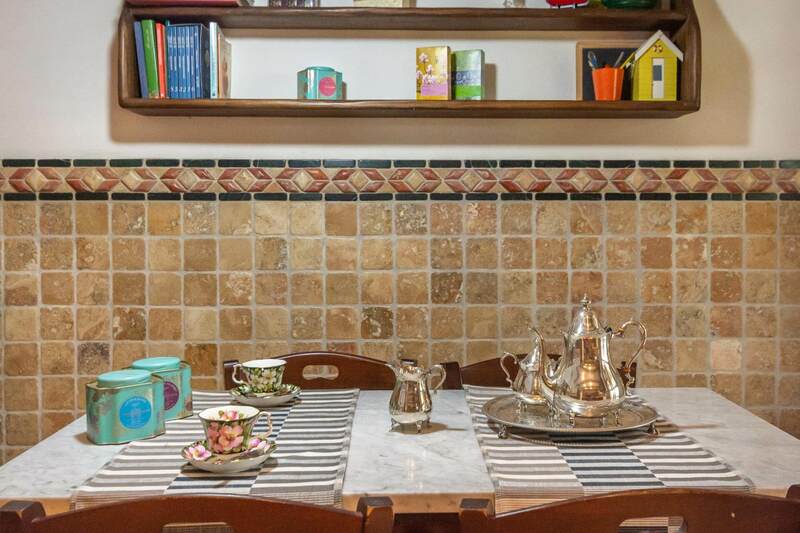 The dining room has an antique extendable table suitable for 10/12 people and a huge antique bookcase. 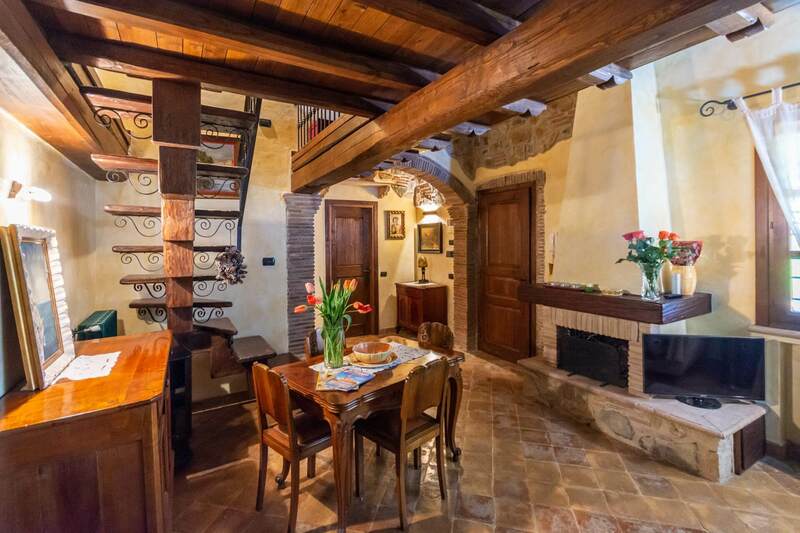 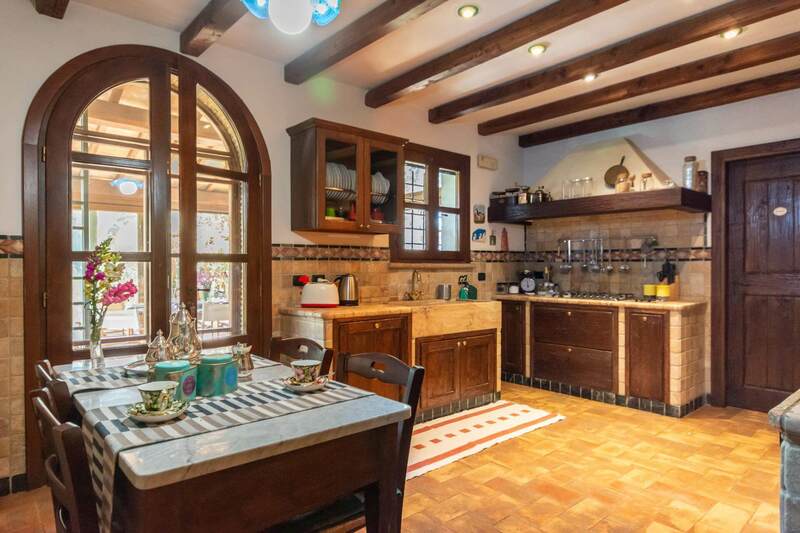 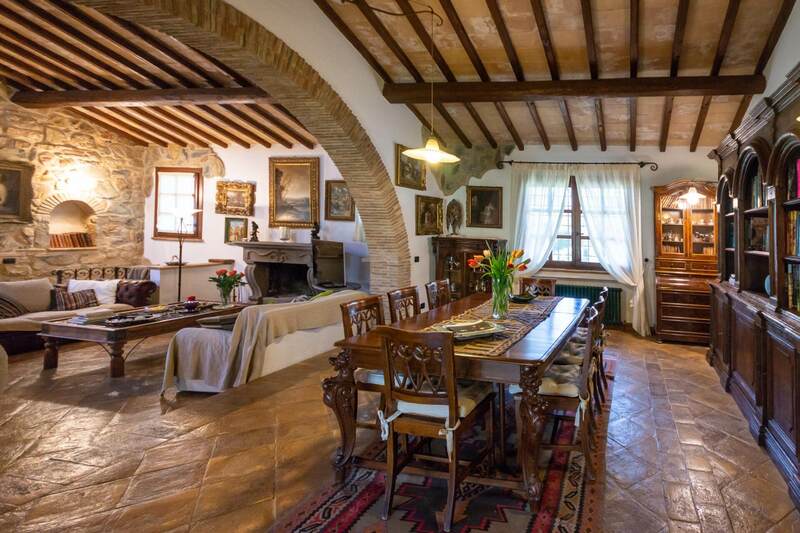 The spacious and typical Tuscan kitchen is built in masonry with a small pantry attached, being equipped with home appliances and 6 burner hob. 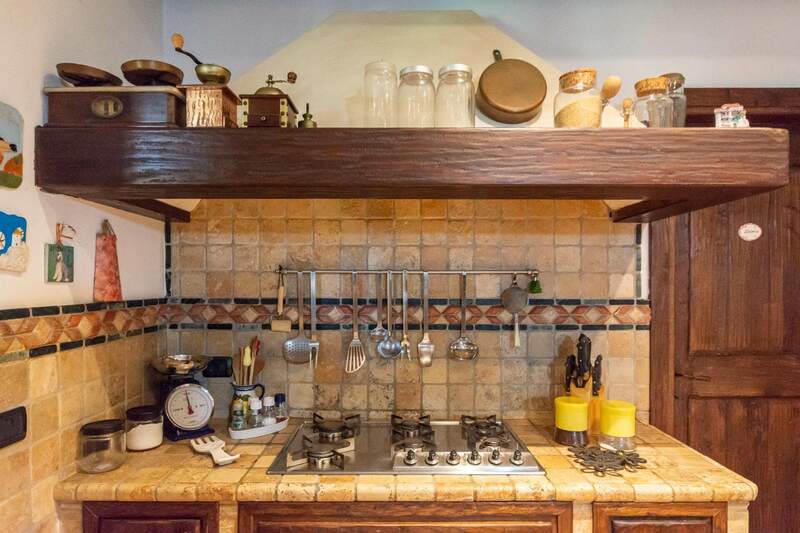 The kitchen has a direct access to a large porch with sliding glass-doors, being furnished with a comfortable round table suitable for 8/10 people. 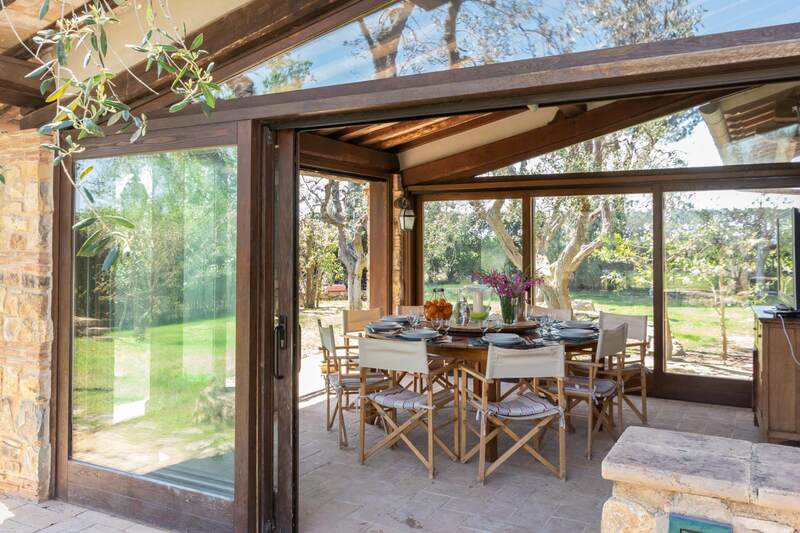 This area is normally used as an outdoor dining room, especially during summer because of its airy location and, being close to the barbecue and the wood-burning pizza oven, it represents an ideal space for lunches or dinners in summertime. 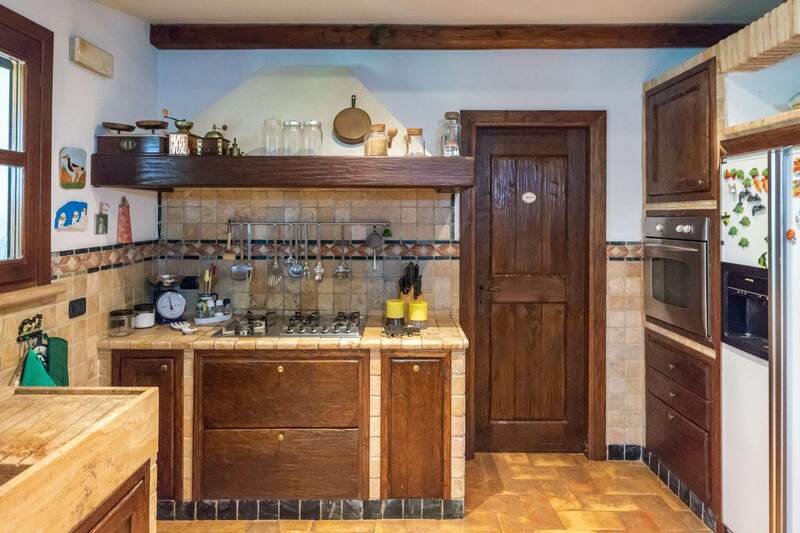 The ground floor corridor connects the kitchen to the sleeping area. 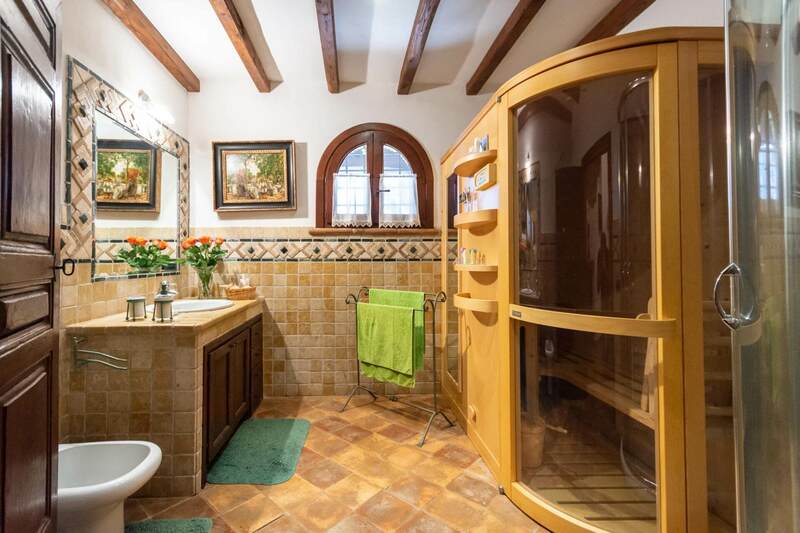 Here is a large bathroom with a sauna. 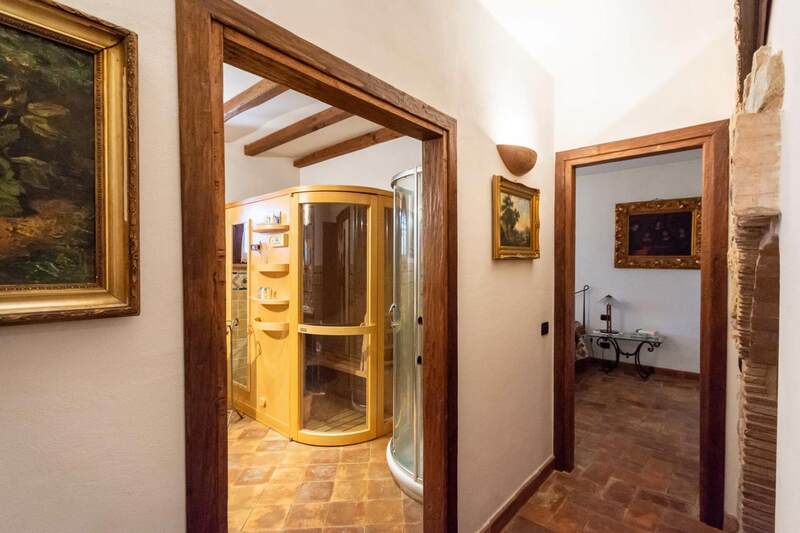 To complete the facilities, the underground level/cellar is partly used as a small gym with fitness equipment and a laundry area, together with a separate bathroom with shower. 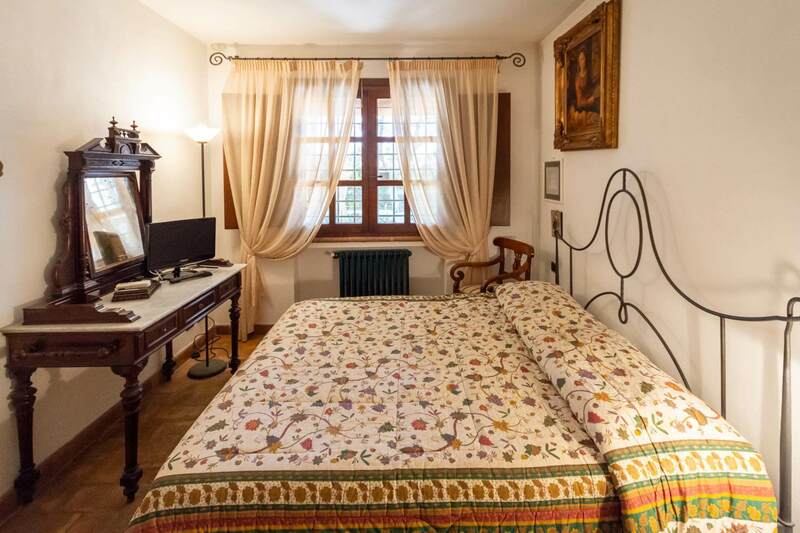 The quietness and privacy of the ground floor sleeping area is guaranteed by a corridor leading to a double bedroom with a wrought iron bed, wardrobe and television. 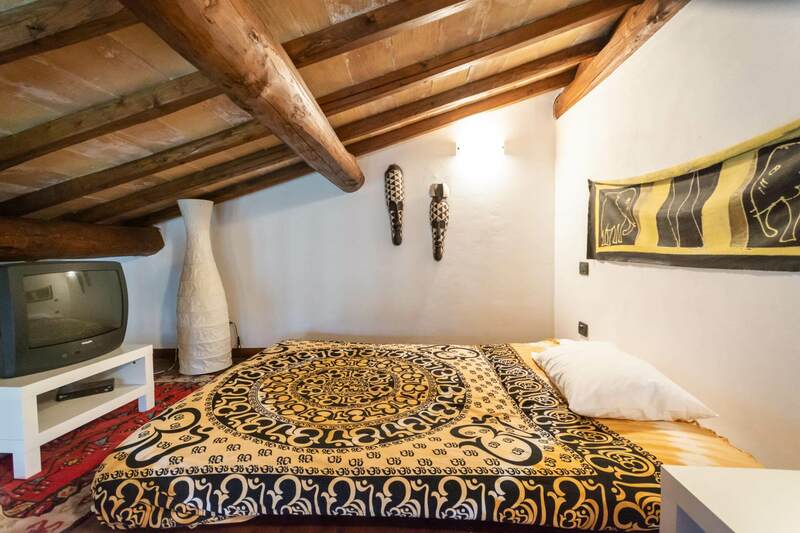 The area also includes a small single room with a sofa bed and a wardrobe as well as a large bathroom with shower and sauna. 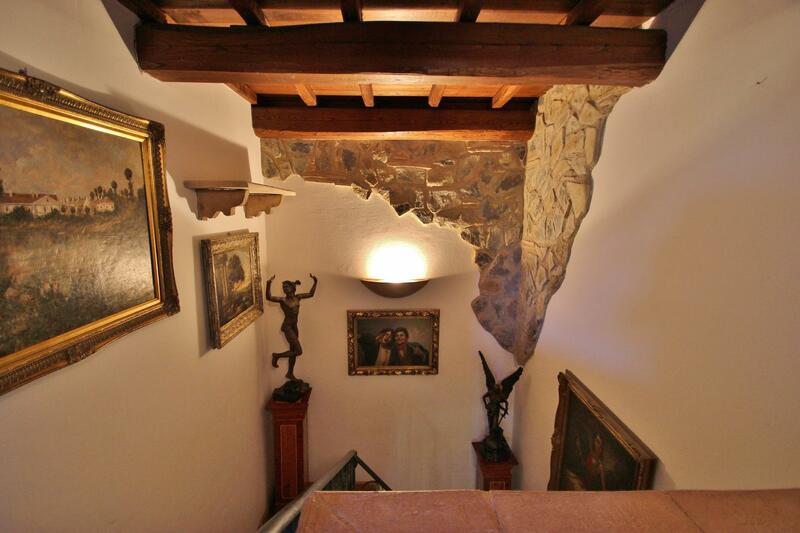 A stone staircase leads to the sleeping area on the first floor. 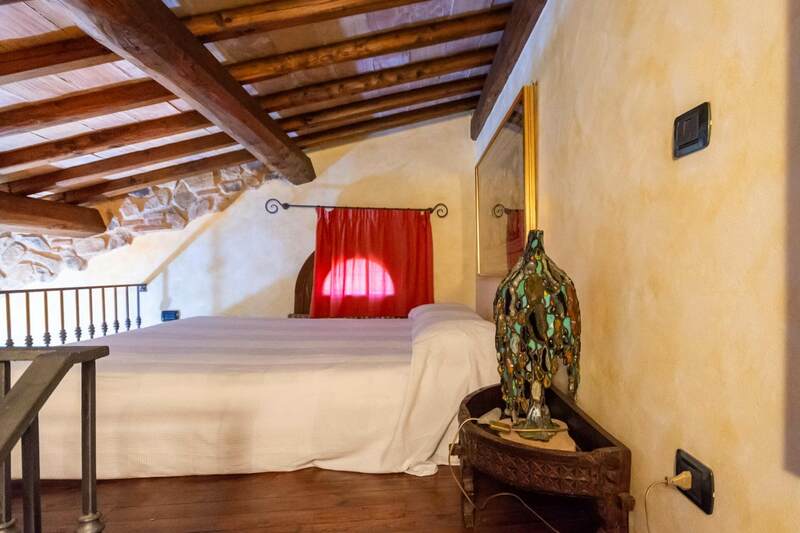 The master bedroom is very spacious, with a wrought iron double bed, a large chest of drawers, a flat-screen TV and 2 separate walk-in closets. 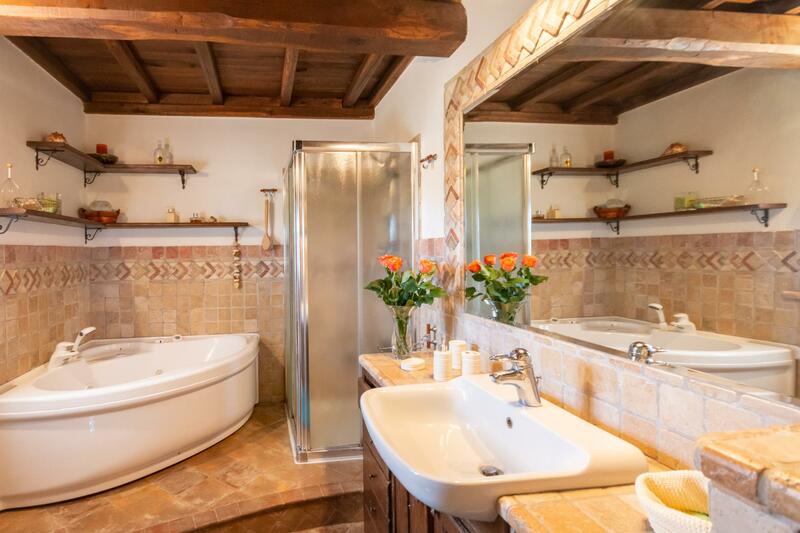 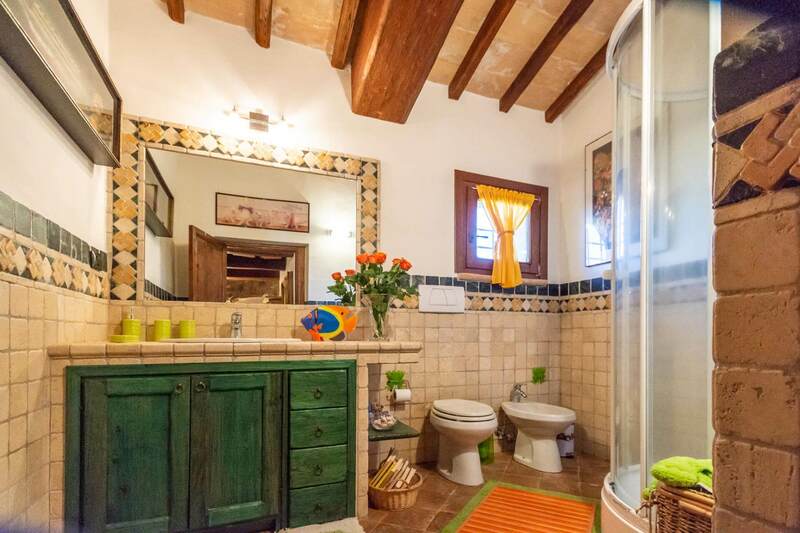 A full private bathroom with a Jacuzzi bath and a shower. 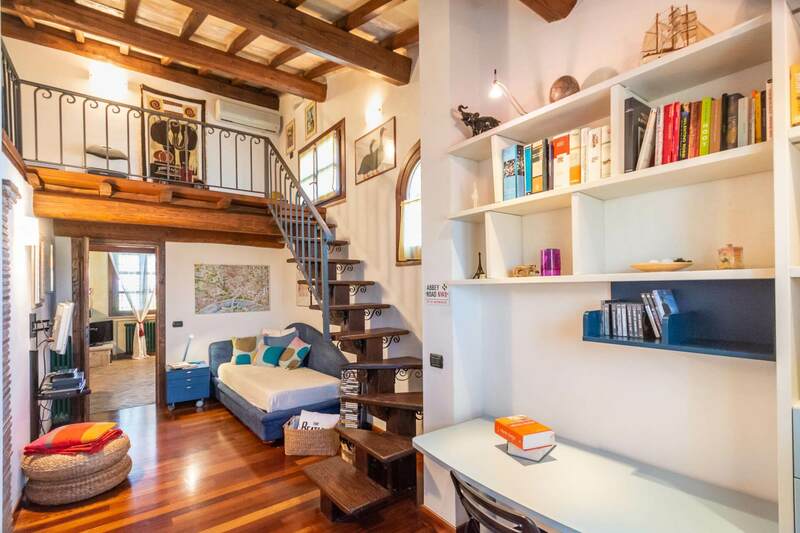 A wooden staircase leads to the mezzanine furnished with a small bookcase and chaise longue, a perfect area to relax while reading a book. 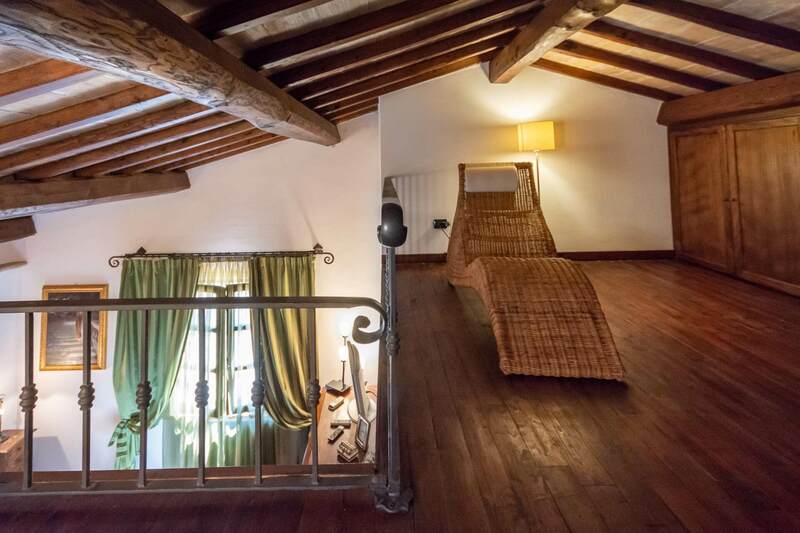 Moreover, on the first floor there is an additional bathroom with hydro-massage shower and a two-level bedroom with a single bed and a large futon bed in the characteristic upper-floor wooden loft. 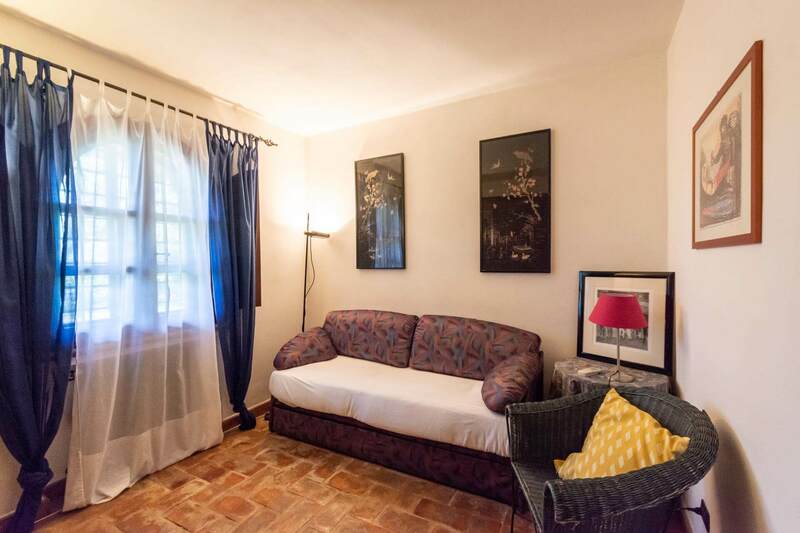 The room has also a large wardrobe / dressing room, a desk with bookcase and a flat TV with Play Station 2. 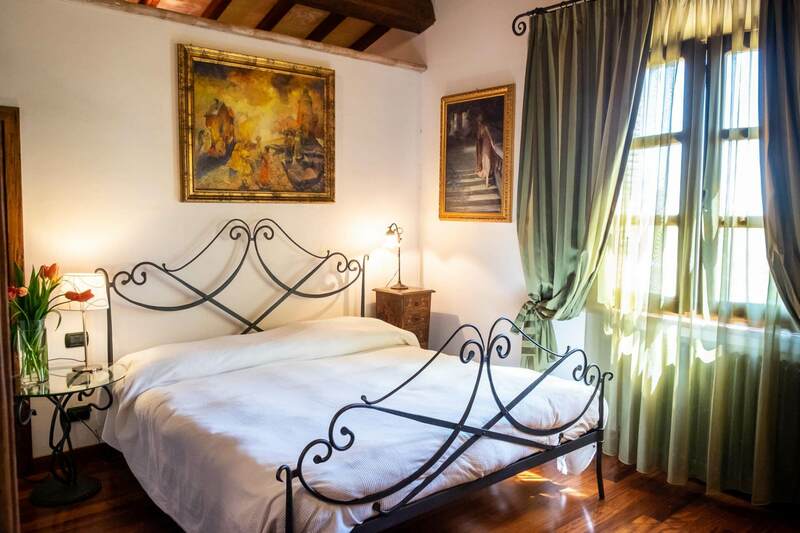 The room is ideal for hosting children and teenagers. 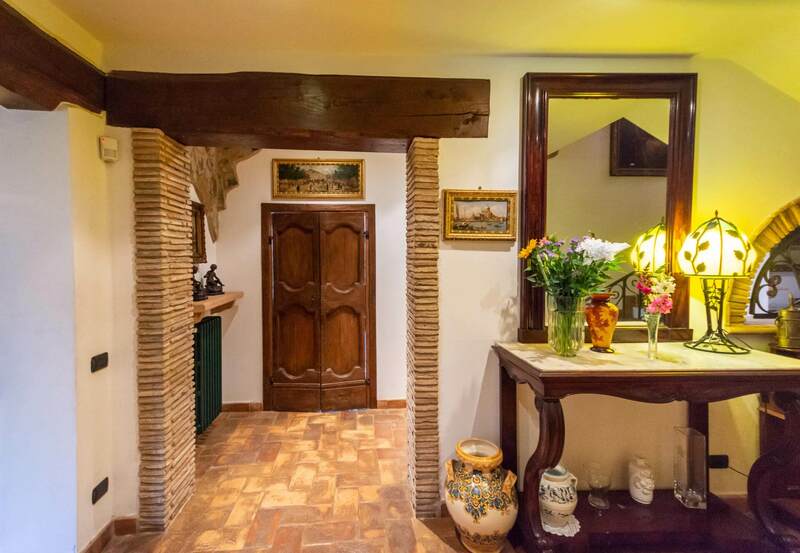 A door separates the children’s room from the Suite which can also be accessed through the external stairs. 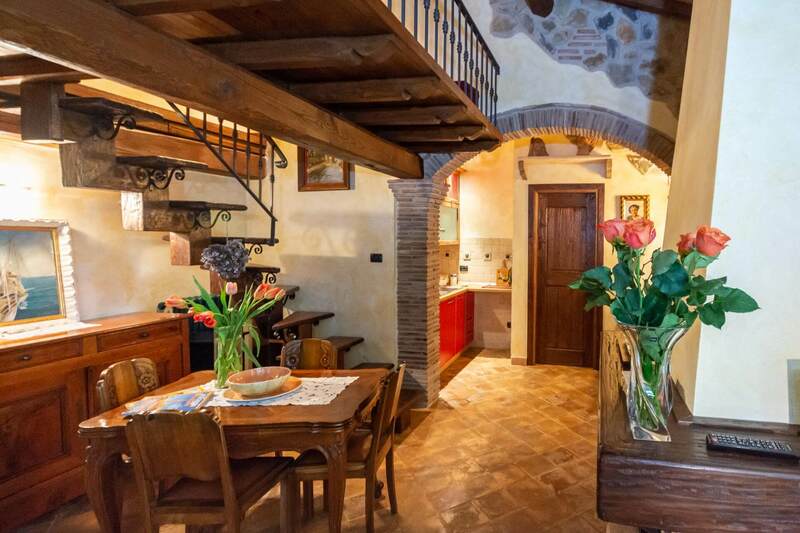 The Suite is eventually self-contained mini-apartment, still being connected to the entire farmhouse. 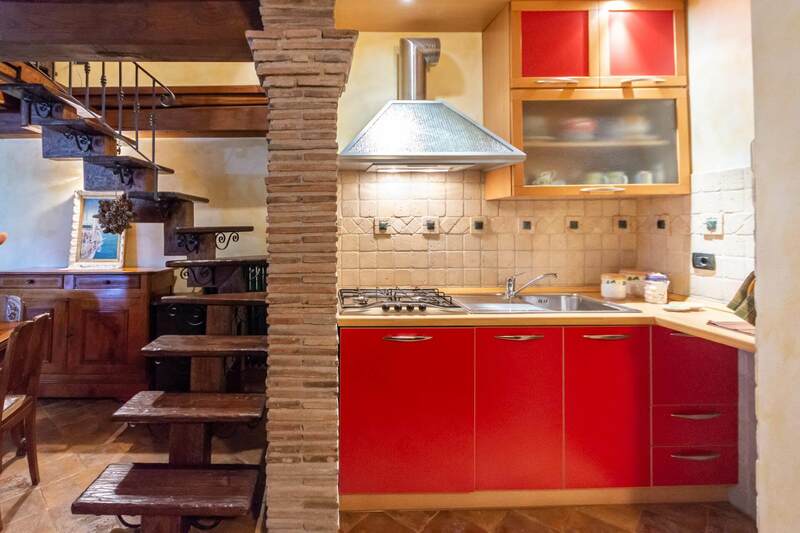 It is composed of a small kitchenette, a fully-furnished bathroom with shower and washing machine, a living room with a flat TV and a double sofa bed. 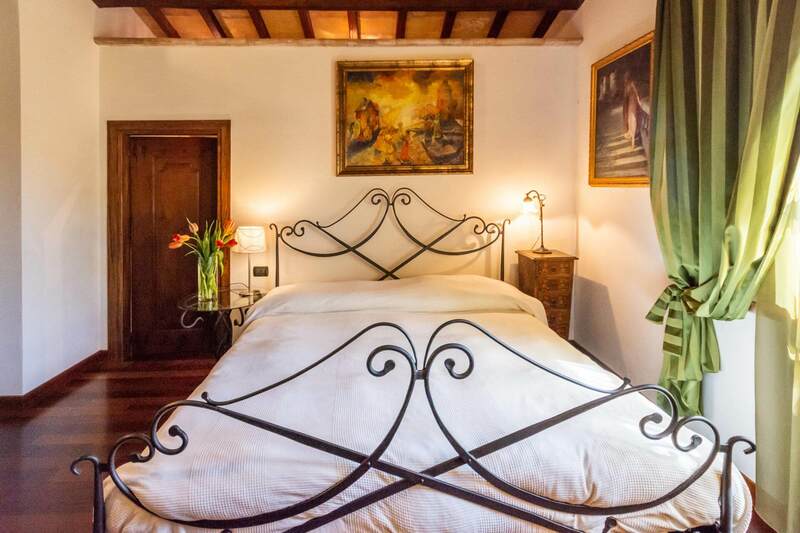 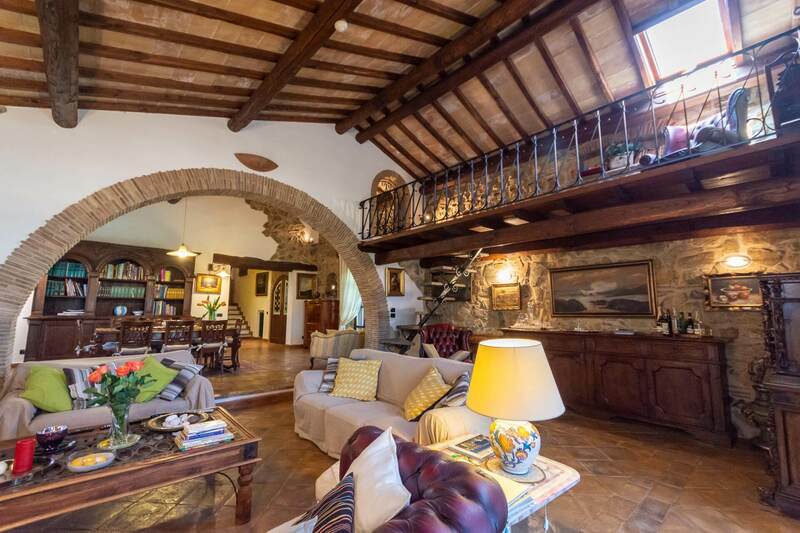 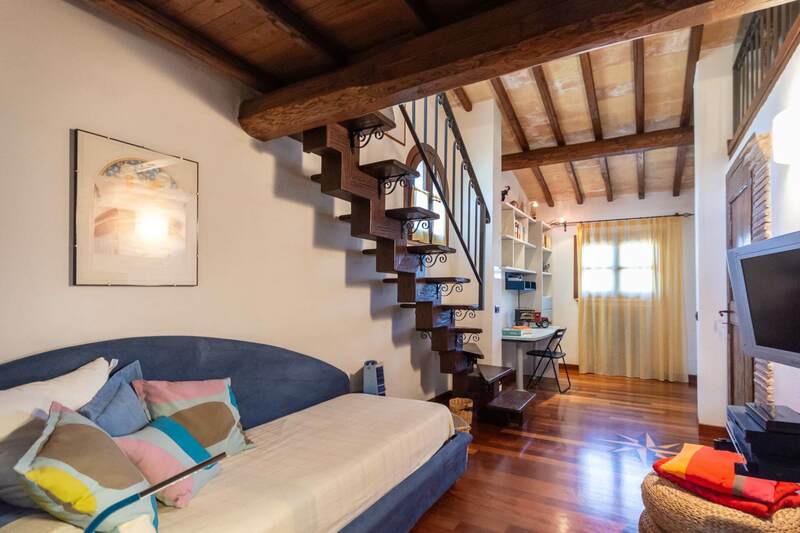 The wooden-and-iron staircase gives the access to the mezzanine, furnished with a double bed. 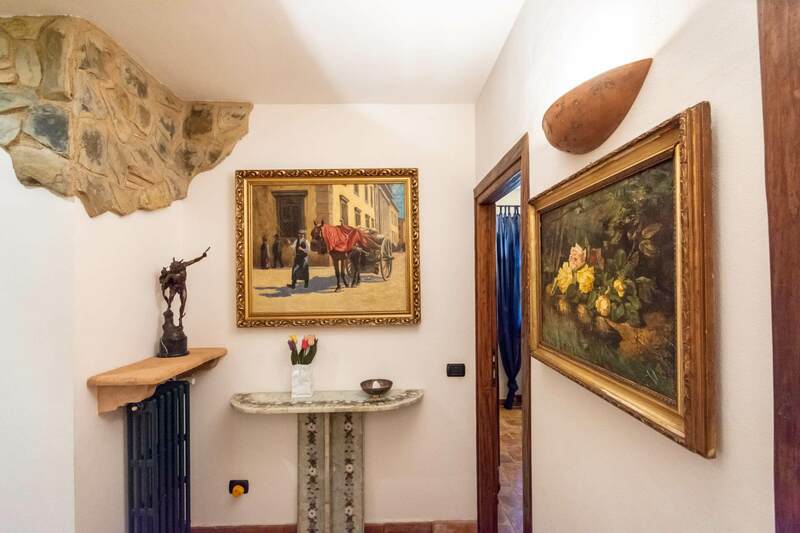 Therefore, the Suite can host up to 4 people and it is easily reachable either through the inside door that connects it to the children’s room or from an external staircase. 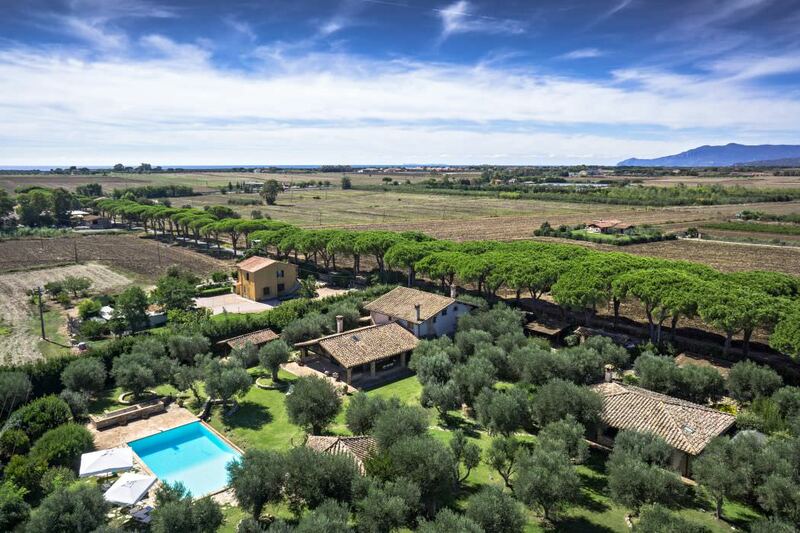 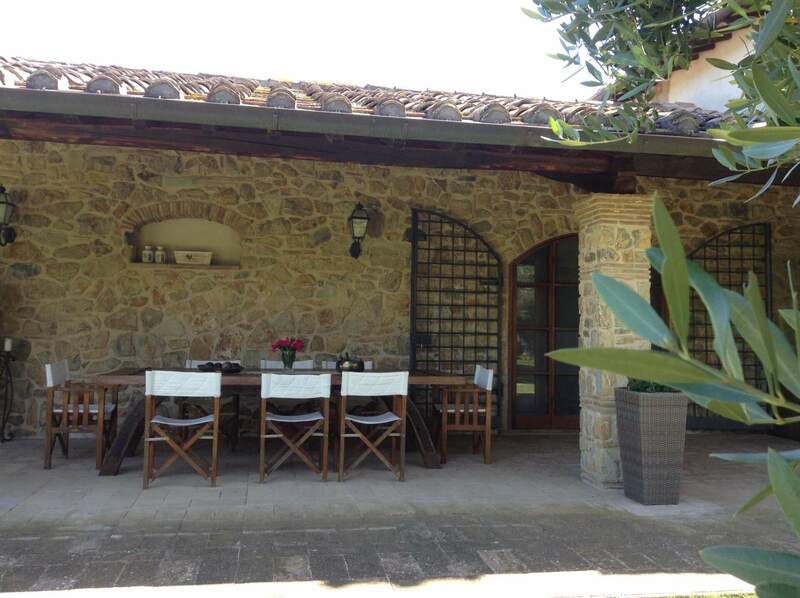 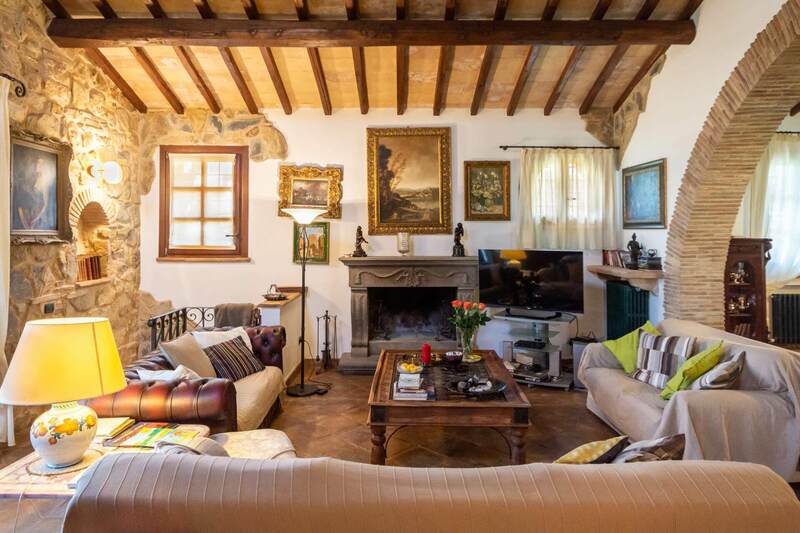 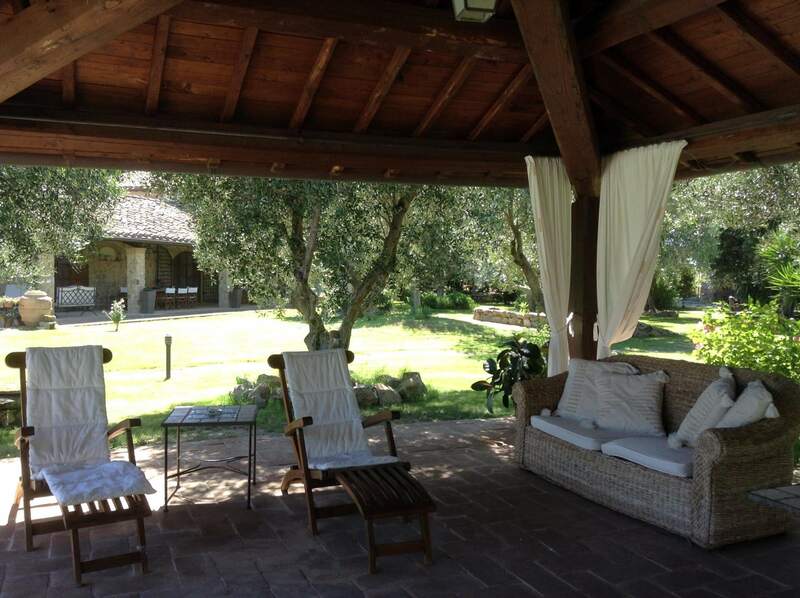 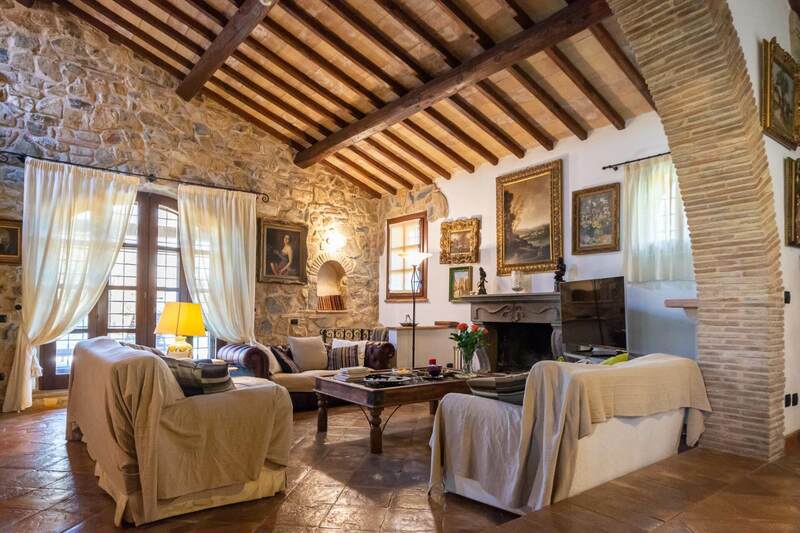 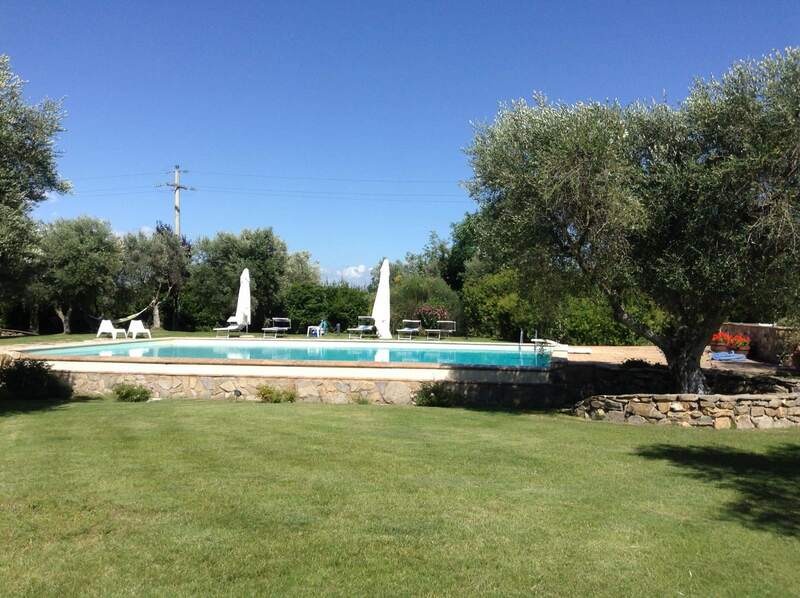 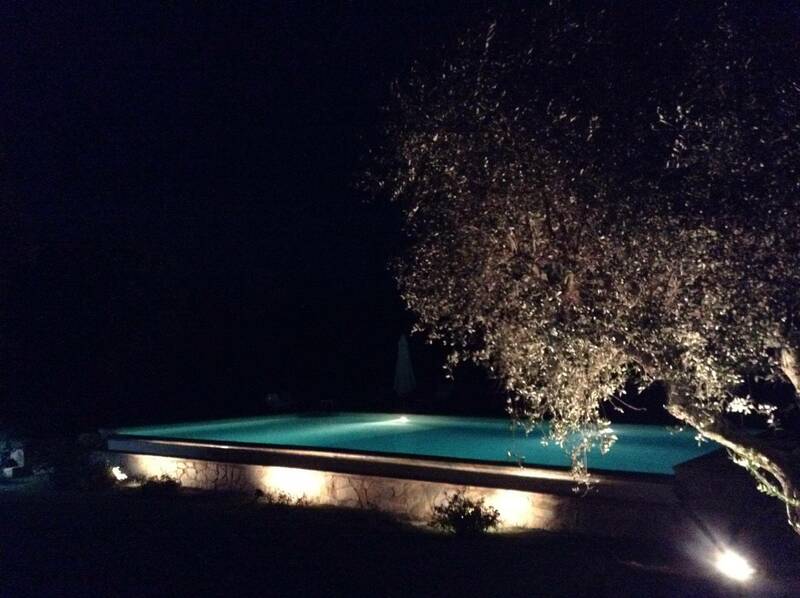 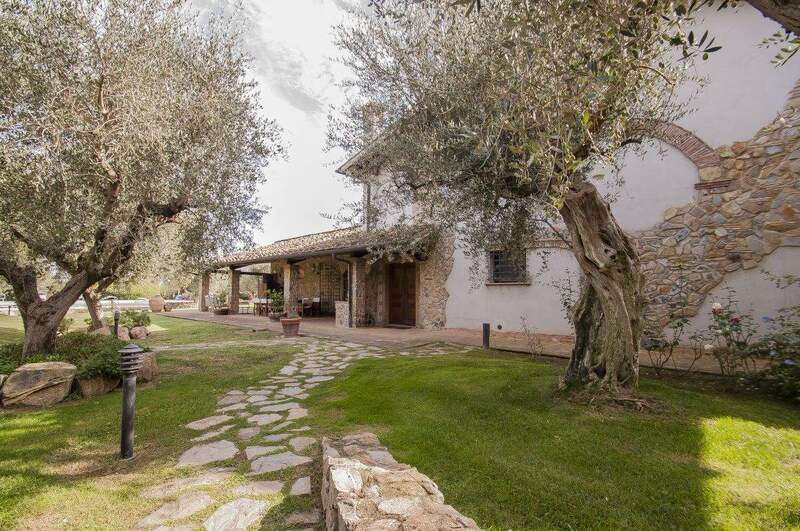 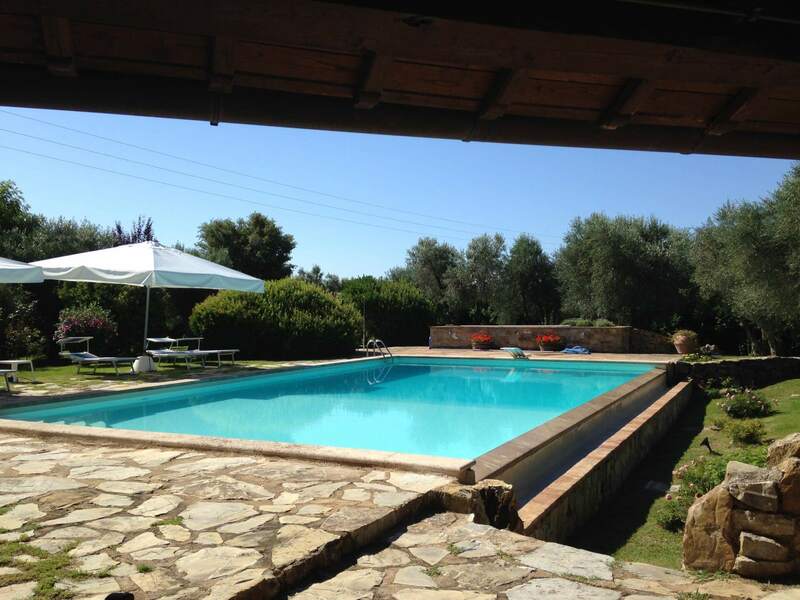 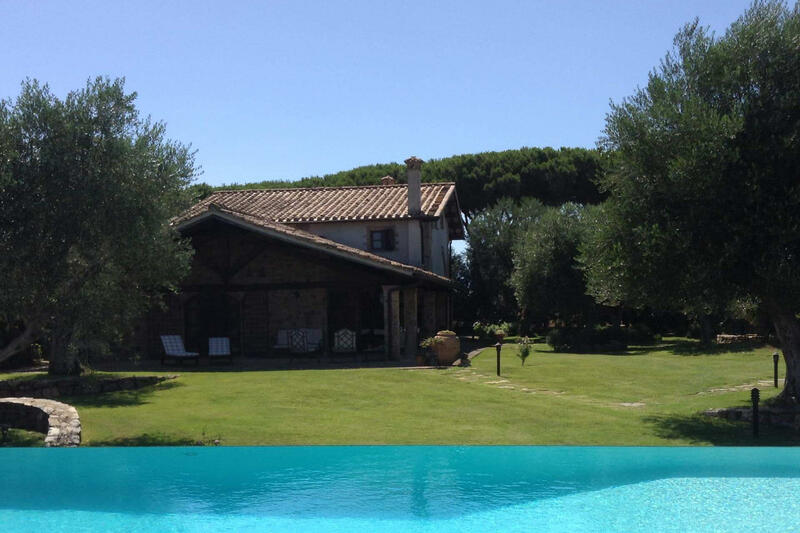 Outside, in front of the farmhouse, there is a large swimming pool (7 x 14 meters), surrounded by olive trees and equipped with small beds, large umbrellas and a relaxing hammock. 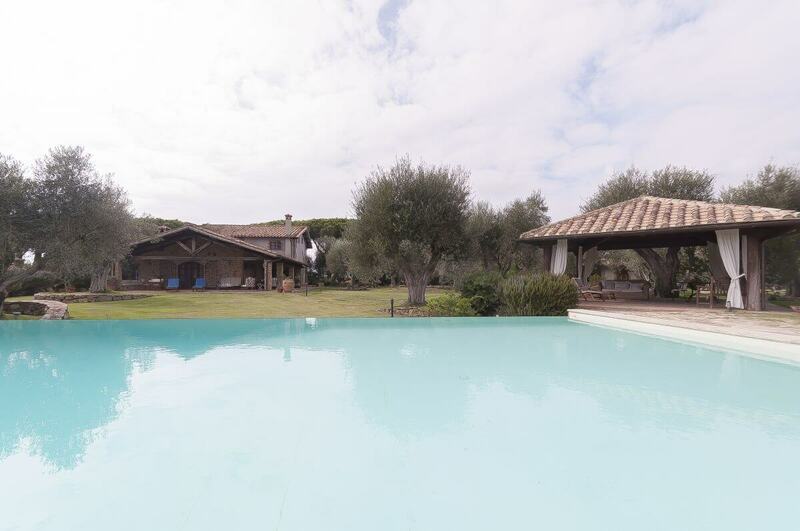 Thanks to the two-level (1.20m and 2.50m) depth the swimming pool is ideal for children playing in total tranquility, swimming or diving. 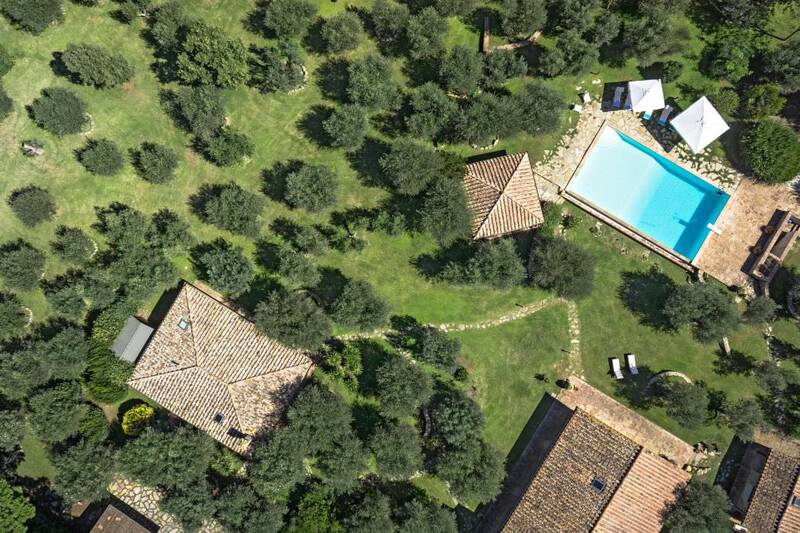 Being surrounded by a stone path and a well-kept lawn, the swimming pool is the ideal place where spending the day in the sun, lying down to rest or being refreshed by a swim in crystal-clear water. 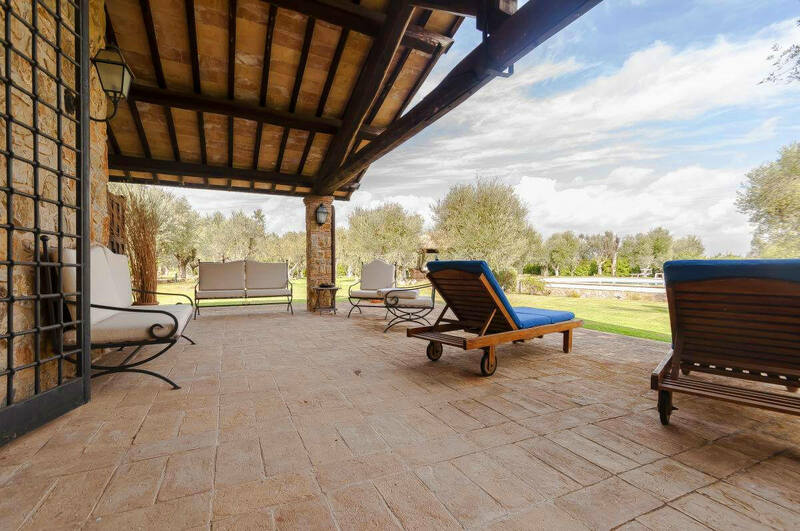 The pleasant atmosphere of the Tuscan countryside will be the perfect musical background for an appetizer in the shade of the poolside gazebo, being furnished with the essentials for an outdoor break such as deckchairs and sofas. 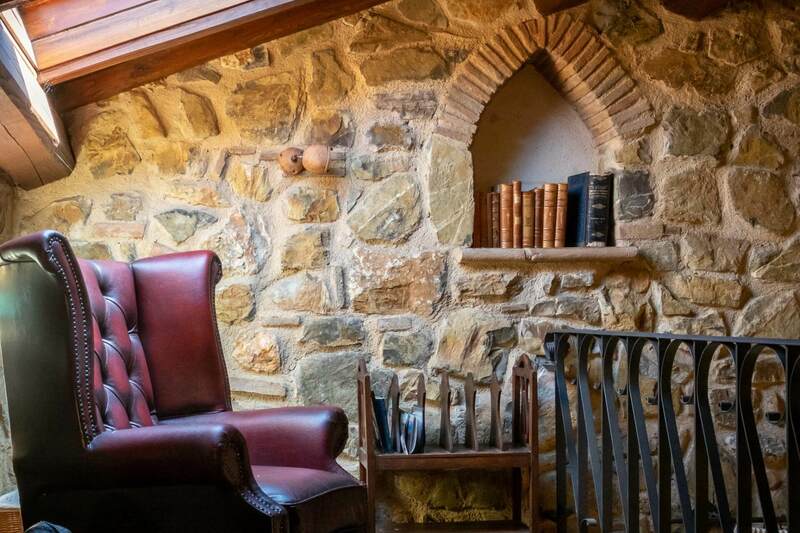 The porch is entirely made of stone and wood, being composed of relaxation areas and a dining space with a table for a lunch or dinner outdoor. 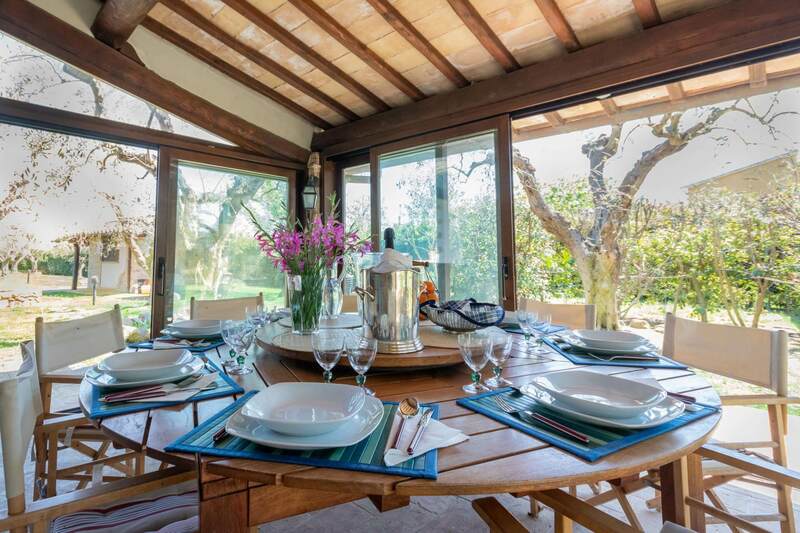 A glass porch with a flat TV and dining table will let you have dinner in the green at any time. 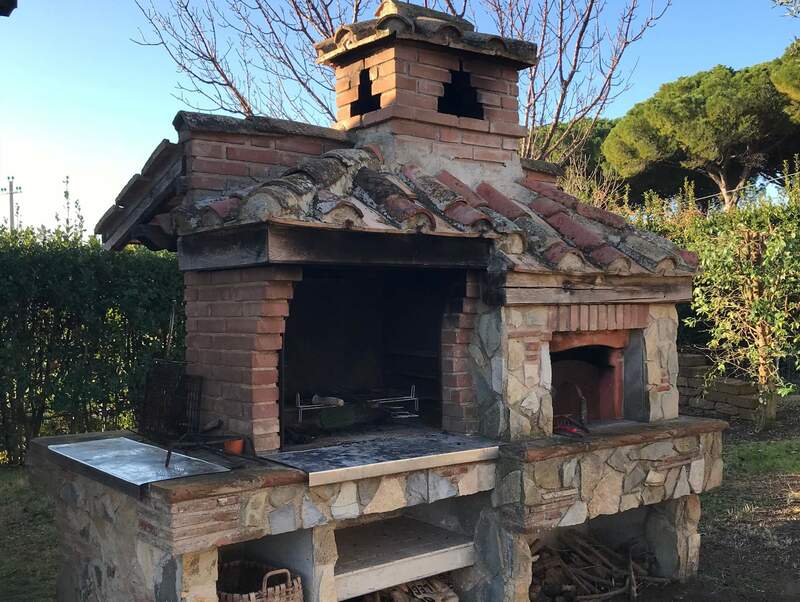 Moreover, the nearby stone-fired wood oven gives you the chance to prepare homemade pizza and bread. 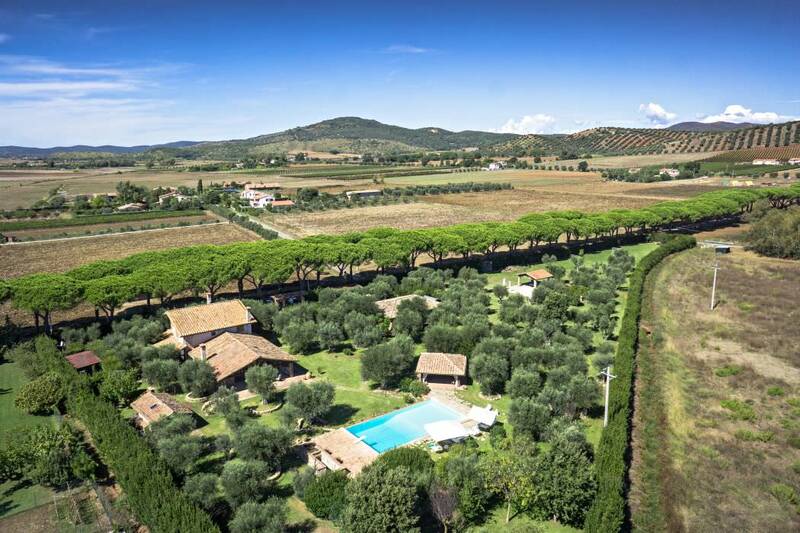 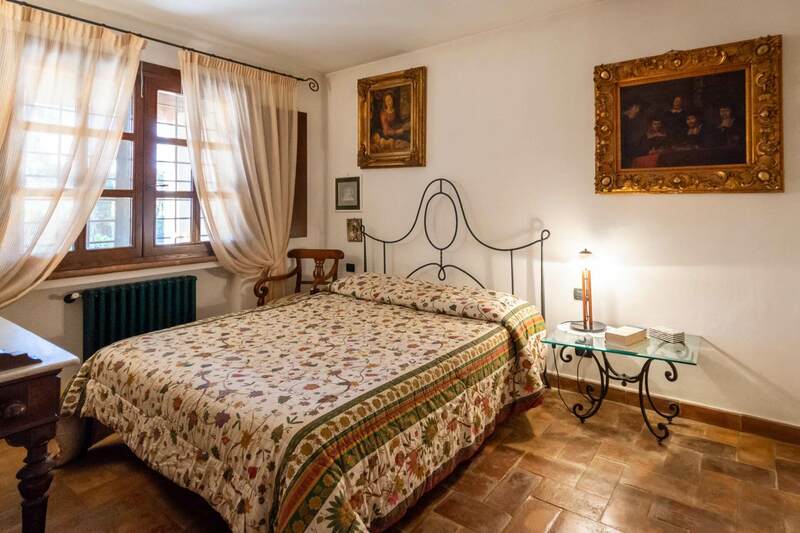 Casale degli Ulivi is entirely surrounded by a beautiful one-hectare park with numerous ancient olive trees and various Mediterranean plants, flowers and trees. 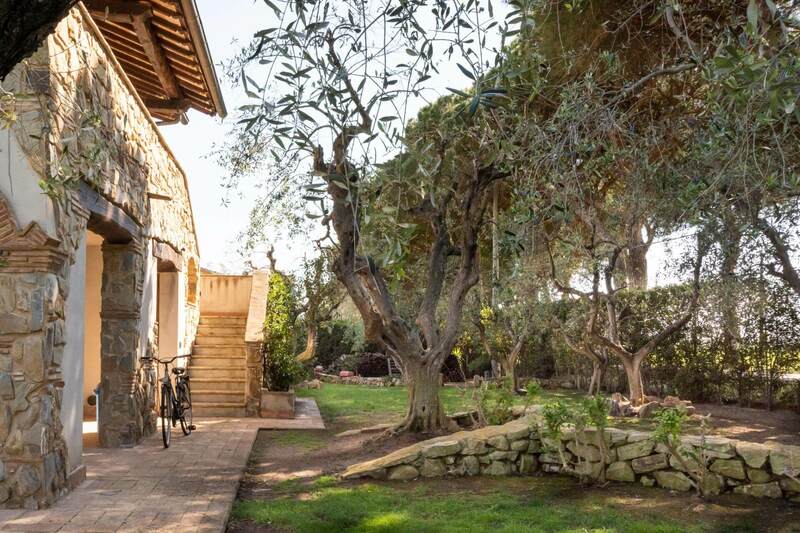 Being tidy in every corner and crossed by stone paths, the garden lights up for the night and walking through the park connects you with the nature and the scents of the colored Maremma. 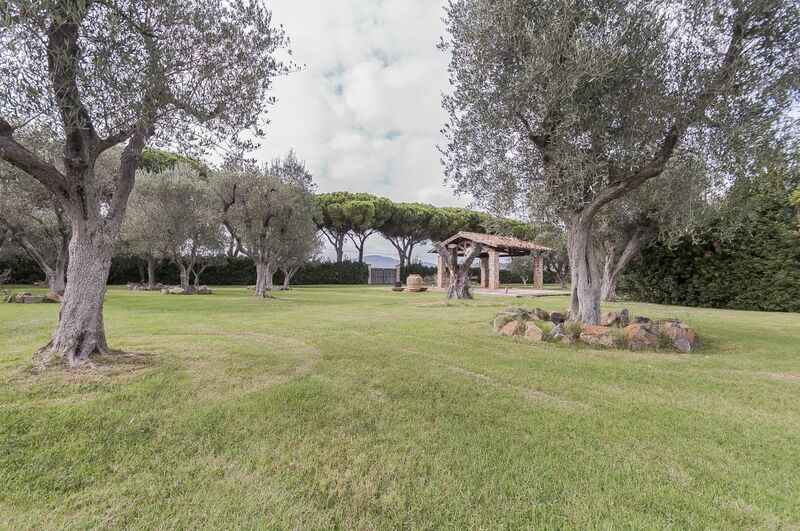 Moreover, being ideal for sports at any time of the day, the park is also served by a football pitch for adults and children with an additional gazebo equipped with table tennis. 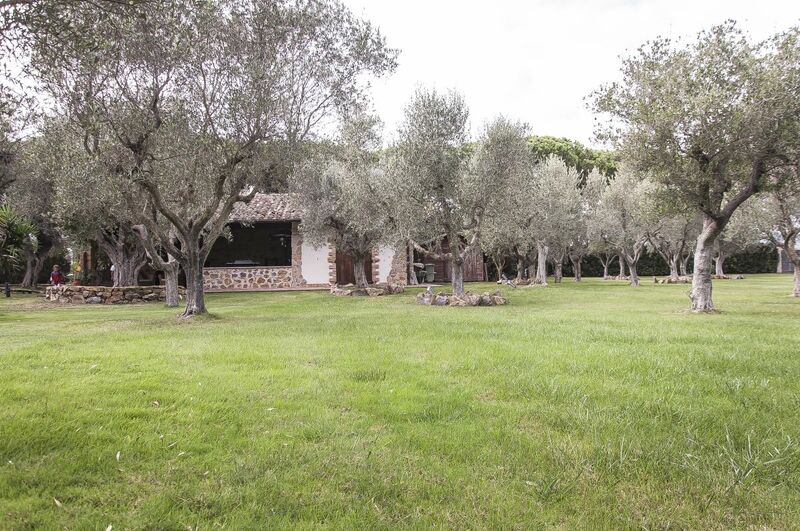 Also you will have up to 2 parking spaces available next to the house in a convenient location.